MAHINOG, Camiguin, January 11 (PIA) -- Town mayor Alex R. Jajalla expressed gratitude to the Japan government for the construction of P568-million worth of flood control projects at the inauguration ceremony here in barangay Pontod on Saturday. “On behalf of the municipal government and the people of Mahinog, I wish to convey our endless gratitude to the Japanese government through Japan International Cooperation Agency (JICA) represented today by His Excellency Akio Isomata, Minister for Economic Affairs, Embassy of Japan in the Philippines, for extending its assistance in the completion of two Sabo dams and reconstruction of heavily damaged bridge that would help save lives and property particularly in the Municipality of Mahinog," the local chief executive said. It can be recalled that Camiguin was hit by massive flash flood triggered by typhoon “Nanang” in 2001 that left untold death and destruction in various parts of the island province. The hardest hit was barangay Hubangon in the municipality of Mahinog. Jajalla said with traumatic experiences after the flood, people were afraid every time it rains hard. “We were too scared every moment it rains very hard. We felt insecure and nervous, fearing the worst flood was to hit again,” Jajalla said. He said after the project was in place, people can now sleep very well. “Now with the huge Sabo dam in place, people will now feel safe and assured of safety as we will no longer fear being hit by flood as we know this dam is designed to control flooding, or lessen flood damage in low lying areas,” the mayor added. Jajalla also acknowledged Governor Jurdin Jesus M. Romualdo and Congressman Pedro P. Romualdo for giving their best effort from conception to completion of this important project that will play a very important role in Camiguin's economy and disaster risk reduction management campaign. 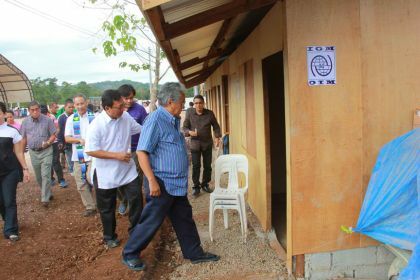 “This project will not only provide the community for safer living condition; it will become an asset for greater economic productivity in this beautiful island of Camiguin,” Jajalla said. “The new bridge that we also unveil today is more than just a bridge that links the entire province. This is, indeed, a bridge to the highway of opportunity that would drive trade and commerce, trigger local economy and generate job creation in the entire province,” the mayor added. Jajalla stressed that though this project is a major achievement to celebrate, much work still remains to ensure that people are safe. “After this project, more long-term and sustainable development approaches are still needed to be done,” he stressed. “We will continue to lobby developed country governments like Japan to show more urgency in dealing with climate change and continue to provide additional grant aid projects related to climate change,” he said. The local chief executive expressed hope that JICA will return to Camiguin for more development assistance projects that will improve the quality of life among Camiguingnons. For his part, Isomata said Japan will continue to help Filipinos in preparing for natural disasters. However, he reminded the public not to become complacent with the project, but remain vigilant and prepared for disaster.